It is the end of British Science Week where we celebrate all things STEM (Science, Technology, Engineering & Maths). So what was I doing before I discovered coding? Well, I was previously working with a Young Offenders Team of a Council back in London & volunteering with young people in the hopes of becoming a Children’s Psychodynamic Counsellor. Yes. I was training to be a “Shrink for Kids”! During this time, I went to Birkbeck, University of London & graduated with a Certificate in Counselling in 2016. It was a proud moment for me & my family as I was the first to graduate! What happened after? I thought about doing a Masters in Counselling at Goldsmiths, University of London. I received an offer but it was at that point, I had an epiphany (as corny as this sounds!). I realized I had fallen in love with the idea of being a Counsellor but didn’t actually want to be one. In the end, I turned down the offer. So what next? I went to uni again! I was quite lost & genuinely had no idea what I wanted to do in my life. I started a degree in Business & French Language in October 2016 hoping that something I learn will spark an interest…… & nothing did so I balanced my first year of uni with a full-time job. The following year, when the 2nd year came around, I quit my full-time job & I got onto a course with Code First: Girls. It was a part-time introductory course to Front End Web Development (free for students by the way!) held at Level 39 which was the perfect place to learn how to code by the way. It ended in early December 2017 & after being part of the winning team for best project on the course, I gained even more encouragement to pursue coding. After the introductory Code First: Girls was done, I tried my hardest to learn how to code independently which was a difficult challenge for me to take on. March 2018, I was diagnosed with dyslexia, dyspraxia & ADD (Attention Deficit Disorder) which added a further challenge to my coding journey but the feeling I got when I managed to type up code, figure out an algorithm, build a webpage.. there’s was no way I was going to let go of my new found purpose because of what the doctor said. 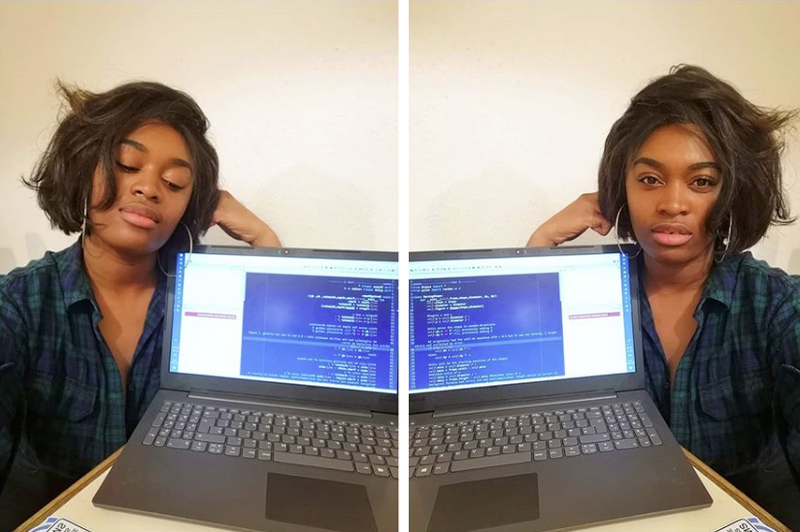 Baby hair + Afro + Coding = BOMB!!!! July 2018 came along & I received the monthly Code First: Girls newsletter which declared that applications were being taken for a Digital Intensive Program called “furtHER”; a full-time, four-month ‘coding boot camp’ which would be provided through the partnership of Code First Girls, & the world’s largest telecommunications company, BT Group. Not only that, they would be offering opportunities for every accepted member of the cohort to be interviewed to become Junior Software Engineers & Developers at different locations across the UK! Would you have said “No” to this? Even though you were a full-time student? I didn’t! I applied & I got accepted! You must think how crazy I was to want to do this alongside the final year of my degree but I couldn’t ignore this opportunity. It started in November 2018, it was exciting walking in but nerve-wracking because I didn’t know what to expect either. From Day 1 of the course, I thought it would be great to share my journey using the #100DaysOfCode Challenge on Instagram to give & gain insight into what I was learning. It was amazing connecting with people from all over the world, it opened up doors for blog features, interviews, being given advice on what I was struggling with as well as being asked for advice too which I was truly humbled by. The program introduced us to Front End Web Development, Python, Test Driven Development & Agile. Don’t get it twisted! It was hard! It was one of the most challenging experiences of my life being fully immersed in coding, building projects, pair programming, learning to code with learning gifts (not a fan of the word “disabilities”) all while studying for my exams & submitting essays for uni but it was a period of my life where I had grown so much as a person & as a woman. I prayed my next job will be in tech…. & it was! In January 2019, myself & the cohort, all had interviews with various Line Managers for multiple roles made available to us across the UK. My interview went well & it was relaxed. There was no coding interview for anyone of us, the work we did since the beginning of the program was evidence to show our capability in working for BT. On the same day as the interview & before the day was over, I GOT THE JOB!!!! I was offered a role as a Junior Software Engineer at BT Group meaning that I would be leaving London for Belfast, Northern Ireland in a month from when the job offer was given to me & I was excited! I couldn’t wait! Before I knew it, February 22nd, 2019 arrived. It was the last day of the course & the day of our graduation. It was Day 100/100; an emotional day to say “Goodbye” to the cohort, we were a family, a sisterhood & saying “Goodbye” to family is never easy. I had the honor of giving a graduation speech on our final day which was also emotional for me but I am blessed to have the blessings to share some words. I moved to Belfast the day after the furtHER program was done. It suddenly felt real. I have left what made me comfortable to stand in something uncomfortable but it’s a position I don’t regret. All the tears, the laughter, the look of pride in my mother’s eyes when I told her I got the job, it all amounted to something great! I started my first day on March 4th, 2019, I have been a Junior Software Engineer for just over a week & I have never been so happy! I have a lot to learn but I’m excited about learning, building on my skills & becoming a better programmer every day. My 100/100. Giving a graduation speech. My heart is running laps, I was so nervous! Using the #100DaysOfCode challenge helped me be accountable to ensure that I was learning something. At the end of each day, I would ask myself what I had learned & share it but I also shared what I didn’t understand, what I was struggling with even emotionally. The key for me was to be honest so that anyone else that finds themselves in a program similar to this or even a coding bootcamp can get a real understanding of what they could expect. I know the route I took isn’t exactly traditional but my hope is that by sharing my story, it’ll inspire other organizations to make the investment in attracting people into tech especially for those like me from a low-income background, doesn’t have a degree & a part of the African/Caribbean community. I also hope it encourages you to know that there is a place for you in tech. You are needed & you are valuable. Your voice is important so if you are learning to code, share your journey with the #100DaysOfCode challenge & apply for those tech jobs even if you don’t think you are ready. You don’t need a degree to work in technology but it doesn’t mean you can’t do it. There are so many avenues to get into Computer Science whether you decide to go to uni, teach yourself, complete an apprenticeship, blog about your journey or countless others. I don’t have a degree or any qualifications related to STEM apart from my GCSEs but now, I am living in a moment I have fought hard for. I am a black female British African Junior Software Engineer. My prayers have been answered!! If you have any questions, please get in touch. You can find me on Twitter, Instagram or LinkedIn. Happy British Science Week to you! Here are a few places you can learn to code online for free. I would recommend taking the free route especially if you don’t have the finances to invest in being taught how to code. You can apply for coding courses. Some are free & others you’ll have to pay for. Apart from Code First:Girls, I have never been on any of these coding programs before so please do your research before you apply. There’s also the option of university. It is up to you! Disclaimer: If you spot any errors, let me know. I am dyslexic, dyspraxic & have ADD. Although I went through grammar checks etc, I could have missed something so let me know. Blessings to you all!